Toyota Motor Corporation announces that the cumulative figures for global sales of its hybrid vehicles reached 9.014 million units as of April 30,surpassingthe 9 million unit mark. This latest million-unit milestone was achieved in just nine months. Helping to mitigate the environmental effects of automobiles is a priority for Toyota. Based on the stance that eco-friendly vehicles can only truly have a significant positive impact if they are widely used, Toyota has endeavored to encourage the mass-market adoption of hybrid vehicles across the globe. In 2015, Toyota added a hybrid model of the popular minivan, the Sienta and began selling the latest hybrid icon: the fourth-generation Prius. Toyota also introduced the Corolla and Levin hybrid models in China—with locally-produced hybrid systems—and added a hybrid model of the RAV4 to its ever-increasing hybrid line-up. In India, Toyota showcased the 4th generation Prius at the Auto Expo 2016. As of the end of April 2016, Toyota is selling 33 hybrid passenger car models and one plug-in hybrid (PHV) model in more than 90 countries and regions. Toyota announced the Toyota Environmental Challenge 2050 in October of last year, setting challenges that it will undertake in order to reduce the negative impacts automobiles have on global environmental health to as close to zero as possible, and to contribute to the creation of a sustainable society. In order to fulfil these challenges, Toyota is working to expand its lineup of hybrid vehicles even further and will work to contribute to the environment by achieving annual sales of 1.5 million units, and cumulative sales of 15 million units by 2020. Toyota calculates that as of April 30, the use of Toyota hybrid vehicles2 in lieu of conventional vehicles of similar size and driving performance has resulted in approximately 67 million fewer tons3 of CO2 emissions―believed to be a cause of global warming. Toyota also estimates that its hybrid vehicles have saved approximately 25 million kiloliters of gasoline compared to the amount used by gasoline-powered vehicles in the same class. Toyota launched the Coaster Hybrid EV in August 1997 and the Prius—the world’s first mass-produced hybrid passenger vehicle—in December of the same year. Since then, Toyota hybrid vehicles have received tremendous support from consumers around the world. Toyota launched its first hybrid, the Prius in India in 2010. Toyota also launched the Camry Hybrid in India in 2013 which is the first and only locally manufactured strong hybrid in the country. This is a phenomenal achievement for Toyota globally as we firmly believe that environment-friendly vehicles can only truly have a significant positive impact if they are widely used. 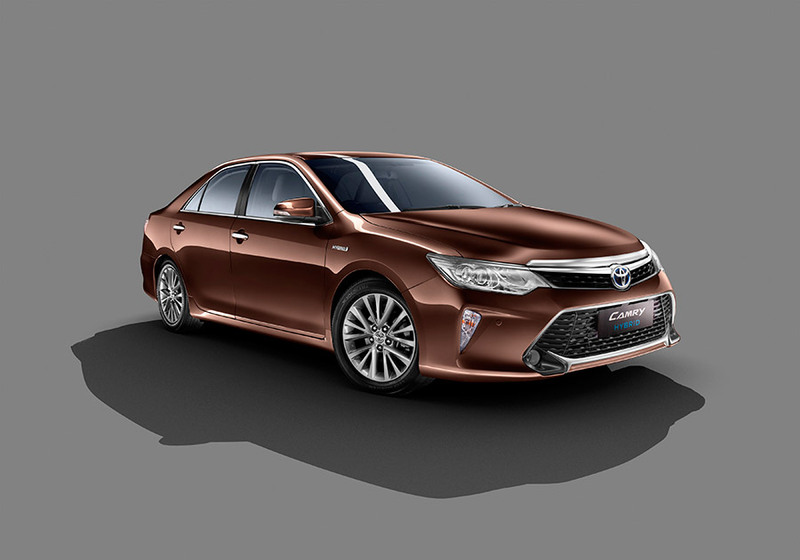 Although hybrid technology is still at a very nascent stage in India and caters to a very niche segment, the Camry Hybrid has received an overwhelming response from our customers and the market alike. The success of Camry hybrid indicates the willingness of the market to accept alternative fuel technology like hybrid which not only benefits the environment but also conserves fuel. Here we would like to thank the government who has encouraged our efforts to promote hybrid technology in Indiaby introducing schemes like FAME-(Faster Adoption & Manufacturing of Electric cars) under which the Camry Hybrid qualifies to receive a markdown of Rs. 70,000 in its price which is passed onto the customer. Also, the VAT reduction by Delhi Govt. in recent budget would give further impetus to the growth of hybrid vehicles in India. Toyota has positioned hybrid technologies, which encompass all of the component technologies necessary for the development of environment-friendly cars and which facilitate the use of different fuel combinations, as core environmental technologies for the twenty-first century. Toyota is committed to continuing its work to enhance performance, reduce costs, and expand its product lineup to create vehicles that are ever-more popular with consumers.